Description: A Bunong family stands in front of their house in the village of Kbal Romeas. The blue paint indicates that the family has rejected the resettlement package offered by the Chinese dam builders. The Bunong are an ethnic minority tribe who inhabit parts of northeastern Cambodia, and rely heavily on natural resources to sustain their community. The community is self sustaining, and does not need to purchase any food, other than salt and spices. The Sesan II dam, if built, will displace multiple minority tribes, as well as substantially impact their ability to farm and fish. The community is currently divided; roughly half the villagers have accepted a resettlement compensation package, while the other half staunchly refuses to leave their land. Caption: A Bunong family stands in front of their house in the village of Kbal Romeas. The blue paint indicates that the family has rejected the resettlement package offered by the Chinese dam builders. 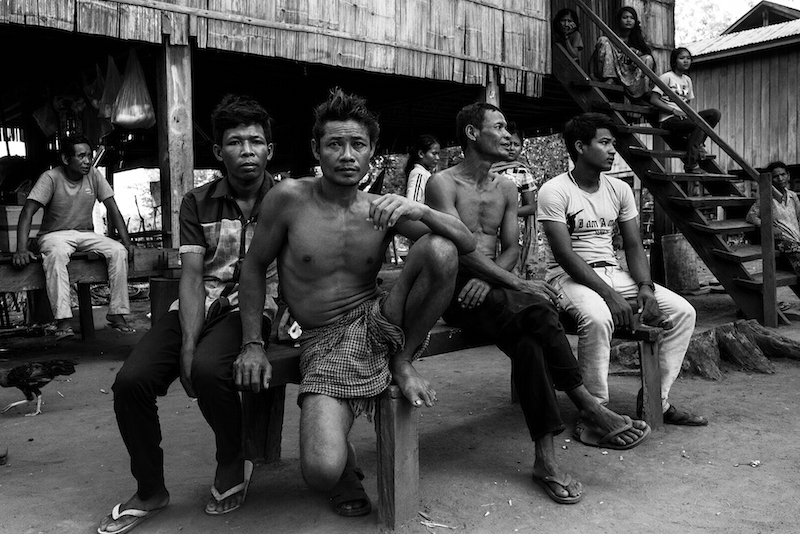 The Bunong are an ethnic minority tribe who inhabit parts of northeastern Cambodia, and rely heavily on natural resources to sustain their community. The community is self sustaining, and does not need to purchase any food, other than salt and spices. The Sesan II dam, if built, will displace multiple minority tribes, as well as substantially impact their ability to farm and fish. The community is currently divided; roughly half the villagers have accepted a resettlement compensation package, while the other half staunchly refuses to leave their land.